Title: How do we bridge the growing cyber trust deficit between China and the West? 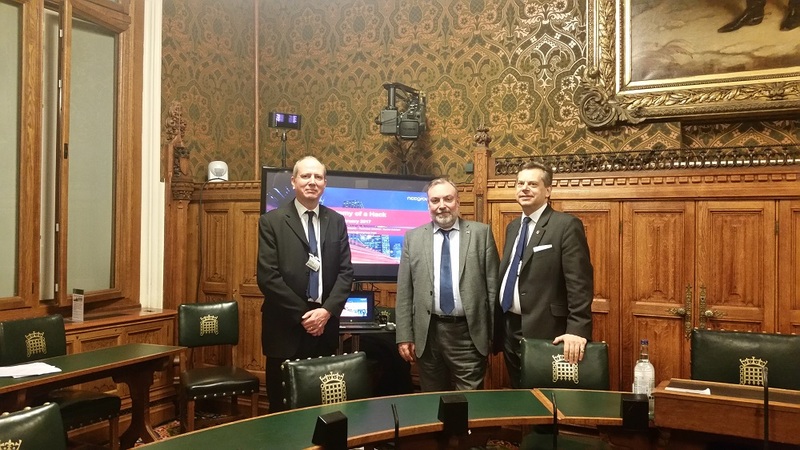 The APPG on Cyber Security will be meeting on the 27th February at 7.30 p.m. in Room 3, House of Lords. During the meeting Bill Majcher will present his view on the trust deficit between China and the West (slides). Please let me know if you are able to join us. The APPG on Cyber Security, chaired by James Morris MP, will be meeting on the 5th February at 6.00 p.m. in Room A, 1 Parliament St.
During the meeting we will discuss the DCMS paper on skills which is attached (here). This will be followed by an open discussion on the questions in the paper. You are invited to hear Max Everett, the U.S. Department of Energy Chief Information Officer, talk on cybersecurity, energy, and critical national infrastructure - a US view of the challenges and opportunities facing the West in 2018. In his role as DOE CIO, Max serves as an advisor to the Deputy Secretary and Secretary of Energy, works with the U.S. National Laboratories to identify and leverage emerging cybersecurity technology, and manages the cybersecurity of the Department of Energy headquarters as well as its 97 sites and National Laboratories across 26 states. Previously, Mr. Everett served as Chief Information Officer in the Office of Administration at the White House, managing the technology infrastructure for the Executive Office of the President, the technology requirements of the Presidential transition, and the Presidential records transfer to the National Archives and Records Administration (NARA). Mr. Everett has held additional technology leadership roles at the White House, the Department of Commerce, and on several National Special Security Events. The meeting will take place in Committee Room 12 in the Palace of Westminster at 17.30 on the 17th April 2018. It will finish at 19.00. Non-Parliamentarians are reminded that they should aim to be at Security 30 minutes prior to the start of the meeting in case there are long queues. Please let me, Andrew Henderson, know that you will be able to attend (Andrew.henderson@wychwoodconsultingltd.co.uk). 13th March meeting of the APPG on Cyber Security: Take 5 and the Cyber Aware campaign - the Rt Hon. Ben Wallace, Minister of State for Security at the Home Office will talk on his recommendations on how to keep you and your constituents safe online. You will have noticed the Take 5 campaign in banks and other financial outlets. You may also have taken part in the Take 5 campaign in January. The APPG would like to hear your feedback and views on how MPs can communicate these important messages around cyber security to constituents. Date: Monday 18th December 2017, 4.00 p.m. Date: Wednesday 1st November 2017, 10 a.m. The Annual General Meeting of the APPG will be at 10.00 a.m. on the 1st November in the Palace of Westminster. The AGM will be followed immediately by a presentation on Ransomware by Professor Keith Mayes, Head of the Information Security Group at Royal Holloway, University of London who will demonstrate how a ransomware attack happens. We also have Declan Hadley, Digital Lead, Blackpool Teaching Hospitals NHS Foundation Trust & Daniel Hallen, Head of Digital Technology, NHS England (North), who will talk about how they dealt with the ransomware attack for the NHS in the North West of England. Date: Tuesday 25 April 2017, 4 p.m. to 5 p.m.
Martin Jordan is a security architect currently working across Defence & Banking clients. He has worked in IT for the past 25 years, focusing on security for the last 18 years. Previously, Martin headed up the Ethical Hacking team at KPMG for 10 years, where he was responsible for the Cyber evaluation of major UK Government projects under the GCHQ CTAS scheme, including the QE Class Carriers. Other organisations Martin has worked for include Defcom Security, Oracle and Babcock Power & Marine. In 2014 Martin formed his own company, CyberEssentialsPlus.com to perform bespoke cyber assessments as well as writing and delivering a GCHQ certified training course, teaching professionals to assess a company’s ability to withstand cyber attacks. He also wrote and teaches a course on Open Source Intelligence gathering. Research projects conducted by Martin include: KPMG Global cyber risk exposure and UK FTSE 350 Cyber Risk Exposure. Jessica Riches is a social media strategist. She was heavily involved in the organisation of the student protests in 2010 in response to the fee rises, coordinating actions using social media. She created and implemented the digital strategy for the Hacked Off campaign in 2012, culminating in their record-breaking petition. She has since consulted on social media engagement with brands including the Nike Foundation, Toshiba and Marks and Spencer, and organisations including the Green Party, the TUC and Barking and Dagenham Council, Goldsmiths University and HRP's Tower of London. Jessica has been named PR Week's 30 Under 30, in the BIMA 100 and contributed to the CIPR's social media ethics guidelines. She has been featured in media including the Guardian, Channel 4 News and Reuters commenting on the impact of social media on political action, and spoken on numerous panels. Date: Tuesday 7th February 2017, 6 p.m. to 7 p.m. Title: How Cyber Hackers Can Stalk You! Date: Wednesday 26th October 2016, 5 p.m. to 6.30 p.m.
Tuesday 19th July 2016, 5.30 p.m. Title: "Modern Challenges in Information/Cyber Security"
Title: "Internet of Things Security"
The speakers shared some views based on their work in the Cyber Security sector, and this was followed by a Q&A.